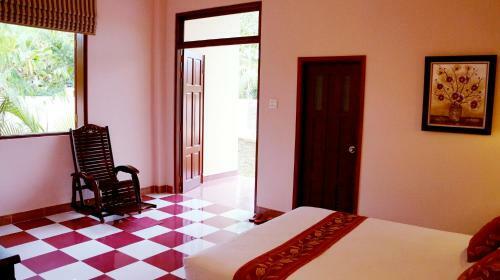 This triple room has a garden view, air conditioning and tile/marble floor. 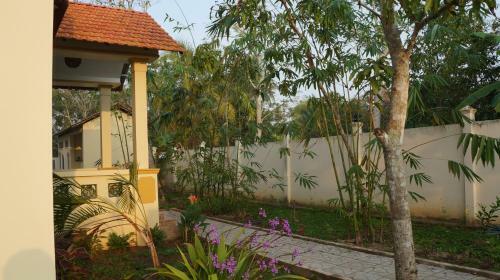 Located in the countryside of Can Tho, Villa My Long offers peaceful and comfortable accommodation with free WiFi access throughout the homestay. 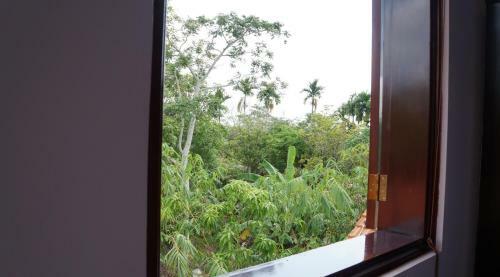 Operating a 24-hour front desk, it features lush green gardens and a sun terrace. If you feel like visiting the surroundings, the Cai Rang Floating Market is 3.3 km away, while Ninh Kieu Pier is 9.3 km away. Can Tho Airport is accessible within a 30-minute drive. 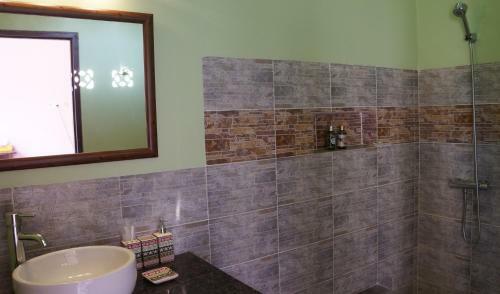 Fitted with tiled flooring, air-conditioned rooms include a wardrobe, mosquito net, minibar, seating area and an electric kettle. 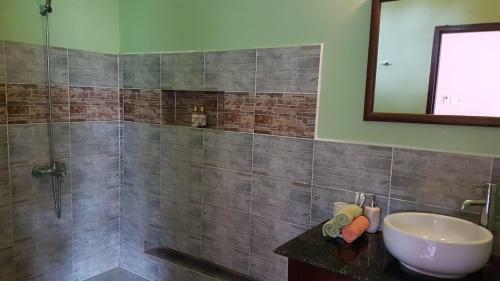 The attached bathroom comes equipped with shower facilities, slippers and a hairdryer. At Villa My Long, guests can relax in the 8-man spa hot tub. 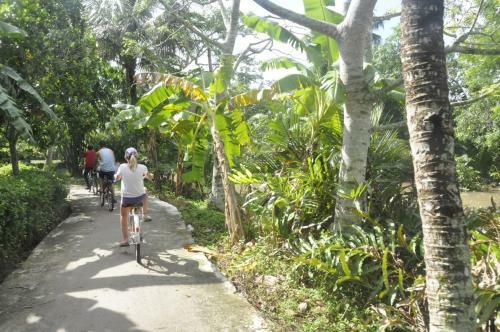 Bicycles are available for rental, enabling guests to explore the area. 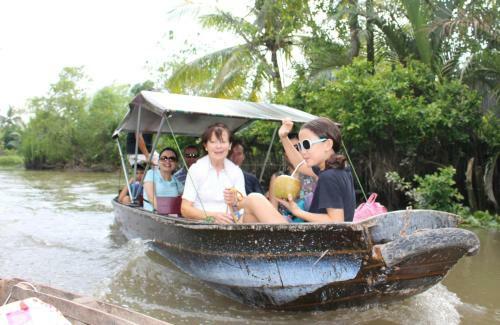 An organized boat tour to Cai Rang Floating Market, cocoa farm and nearby orchards is also available daily. Luggage storage is available, while laundry is available at a surcharge. Vietnamese dishes are served upon request. Boat transfer from My Khanh Market to the villa is free. Transfer from Can Tho Bus Station to My Khanh Market is free for travellers coming from Ho Chi Minh City with Thanh Buoi or Phuong Trang buslines. Taxi cost from Can Tho Airport to My Khanh Market is around USD 10. === Boat hire is available on the property. Please inform Villa My Long in advance of your expected arrival time. You can use the Special Requests box when booking, or contact the property directly with the contact details provided in your confirmation. Well...if your truely interested in visiting this area around Can Tho, then Villa My Long IS the place. Even arriving by Long-Boat is a buzz. Pierre (owner/host) and Jack (manager) were fun, interesting and helpful. We even hired Jack, boat driver etc & spent from 05:30-14:00 with this team & visited both floating markets. Wonderful. Do it! All good. Maybe some more bottled water would have been good. Nos encató el emplazamiento, el verdadero Mekom. 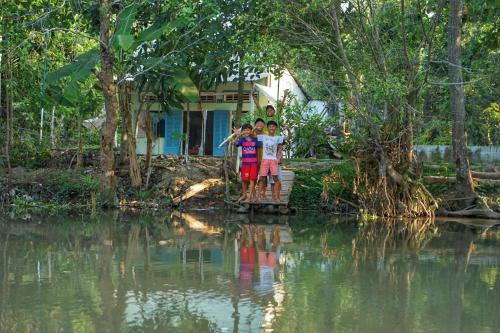 Een zeer mooie villa gelegen lang een rustige zijarm van de mekong. Je komt er helemaal tot rust. Mooie grote kamers. Lekker eten. Goede service van de mensen! Toen we besloten om maar 2 ipv 3 nachten te blijven moesten we geen extra nacht betalen, enkel het deel dat hij moest afstaan aan booking.com. Dus een dikke meevaller. Indien je hier met verschillende gasten samen zit kan ik me voorstellen dat het erg leuk is. Samen lekker tafelen en nadien nog iets drinken op het mooie terras. Nu was het enkele ons gezin en de jongen die de boel daar rechthoudt. De baas zelf hebben we niet gezien. Doordat we in het laagseizoen reisde zaten we helemaal alleen in de villa, er waren geen andere bezoekers. Dit was een beetje een tegenvaller, omdat er echt wel niets te doen is in de buurt. (buiten wandelen) Wij vonden de maaltijden redelijk duur in verhouding met de rest van Vietnam. Dinner was 9$ per persoon en lunch 4$. En het is niet dat je keuze hebt, want er is niets in de buurt en je moet toch eten. Het eten was wel erg lekker. De boottoer naar de heilige boom was een dikke teleurstelling en bijgevolg ook weggesmeten geld. De jacuzzi werkte ook niet. Wij zijn uiteindelijk 2 ipv 3 nachten gebleven. pour le calme, les chambres immenses et bien décorées, l'accueil stylé du jeune personnel, le linge renouvelé chaque jour. On sait où poser ses valises ce qui est presque rare dans les hôtels. Villa Hué à conseiller vivement. De plus ils forment des jeunes pour l'hôtellerie ! Il posto è fantastico, è un homestay. 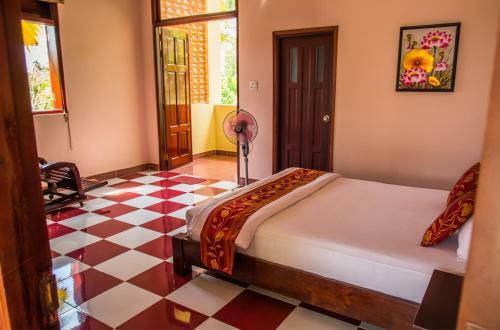 Il posto è fantastico, è un homestay.. lo staff gentilissimo e disponibile ad aiutarci nelle gite e negli spostamenti.. abbiamo cenato lì due sere mangiando piatti vietnamiti preparati espressi solo per noi veramente deliziosi. La posizione non è quella registrata su google map, è nel 'countryside' quindi dopo aver preso un taxi dalla stazione sono venuti a prenderci nel punto prestabilito con la barchetta e ci han portato alla villa.. è un vero paradiso per quello che abbiam vissuto noi, ma va saputo che è isolato quindi per allontanarsi o visitare can tho devi spostarti chiamando autisti con motorbike e poi prendendo un taxi per il centro (non proprio comodo ed economico)..
홈스테이 주변 시골 마을의 평화로움이 좋습니다. 산책하는 즐거움도 좋구요. 저녁식사도 아침식사도 좋았습니다. 예약하는 곳에 배로 태워들어가는 부분을 좀 미리 써두었으면 합니다. 근처를 차로 몇바퀴 돌았거든요. 자가용 손님은 들어갈수 없다는 점도 아쉽습니다. Property was absolutely gorgeous, Jack and Pierre are both very warm and accommodating people. My boyfriend and I were the only guest during our visit so having breakfast served on the terrace upstairs alone and having private dinners was a bonus for us. The dinners were a great way to try some local food and we really enjoyed setting the time we would like all of our meals. 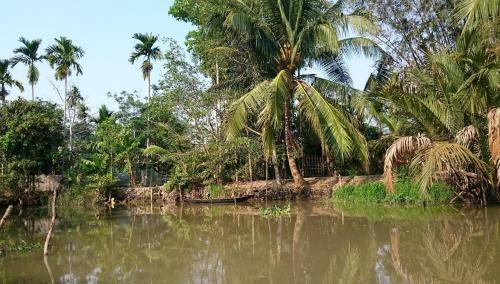 The visit to the market was so much fun, we also had their boat to ourselves and being able to pass through the backwaters and see everyone go about daily life was my favorite. We also did the bike tour to the cocoa farm and enjoyed learning the process as well. I felt very comfortable and at home in the house and also loved playing with the 3 pups that live on the property. I loved everything. The price was a little higher than we initially expected but the quality of our stay, food, and tour was worth it. 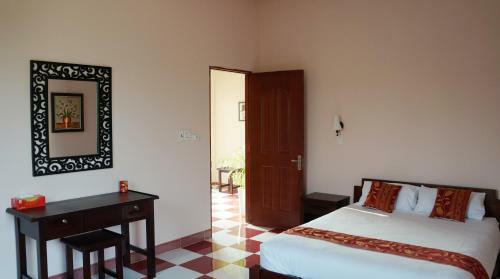 Beautiful guest house and beautiful surroundings. Beautiful guest house and beautiful surroundings.Really nice staff! The price is high for Vietnam but the experience is worth it. 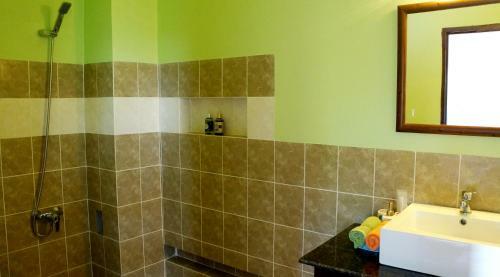 Homestay with warm feeling but with high hotel quality. Very good food. Lovely place in the village by the river front. Super friendly and helpful staff. Far from town (but didn't miss anything during our stay so didn't mind this at all). Nos gustó todo de la Villa My Long, sobre todo el lugar al que se accede en barca. 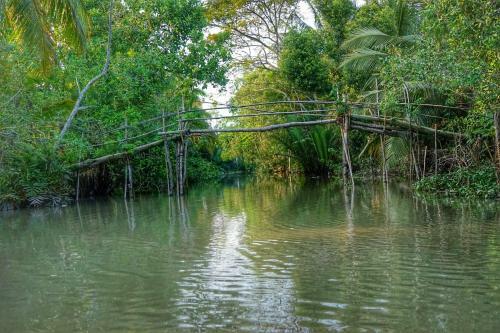 It´s the perfect place to get to know the Mekong Delta. The homestay is beautiful. We felt very welcome and comfortable. The service was very well balanced between attentive and making it possible to enjoy our privacy. The tours were very nice and Jack is a very knowledgeable and friendly guide. Pierre is a very nice host and the food was fantastic (we could taste a lot of local specialties). At first we where a little bit concerned that the pick-up would be complicated (we were asked to have the taxi driver from the airport call to get instructions on where the boat would pick us up), but everything worked out perfectly. 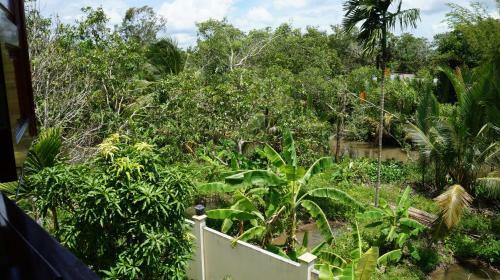 This is a lovely Homestay on the Mekong Delta and perfect for families. The meals (esp lunch and dinner) were excellent and a very reasonable cost. The tours (floating markets, big tree, cacao farm and pagoda) were just fabulous. Jack is doing an outstanding job of 'holding the fort'. 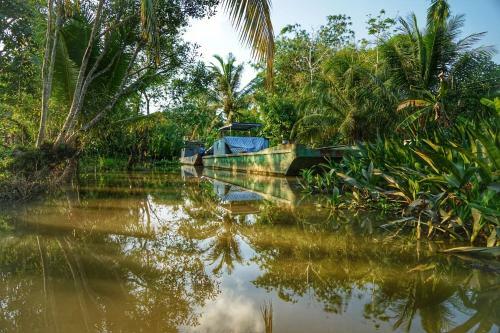 Couple of tips - bring lots of mozzie repellent and if you have a heap of luggage you should try and store some of it - imagine it would be very difficult to clamber on and off the boat otherwise. One of the highlights of our 4 weeks in Vietnam and thoroughly recommended. Thanks to Piere and his wonderful staff. Our host 'Jack' was wonderful and helpful. This place really is idyllic and highly recommended for a few nights. 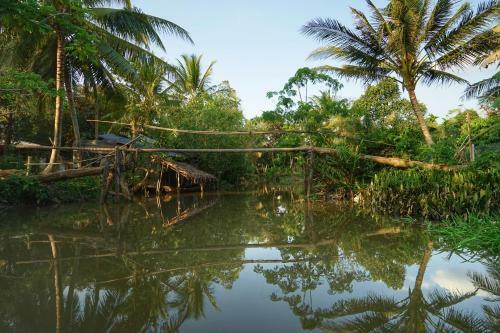 reallly great way to get a sense of the backwaters of the Mekong. It was away from the hot crowded town in a peaceful location on the delta. The staff was first class. Jack in particular worked extremely hard organising our tour and travel demands. The food was also amazing, vietnamese home cooking by a local chef. The private boat tours are available directly from the villa which was great. 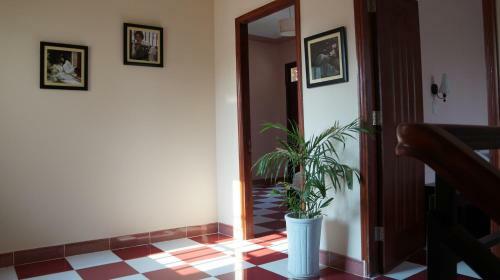 Villa My Long is located right on the bank of Mekong and all transports are depending of the tide. I missed the boat pickup and dropp off depending on that. Three adorable puppies are around your feet, fast geckos on the walls and chickens and roasters in the surroundings, in my opinion I really liked that. 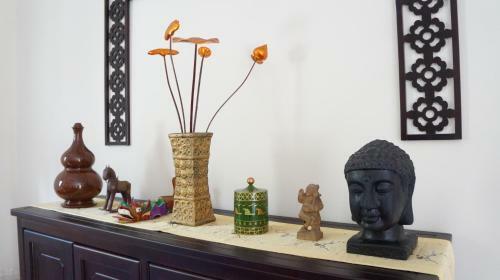 To stay in Villa My Zlong is really something special in your lifre. 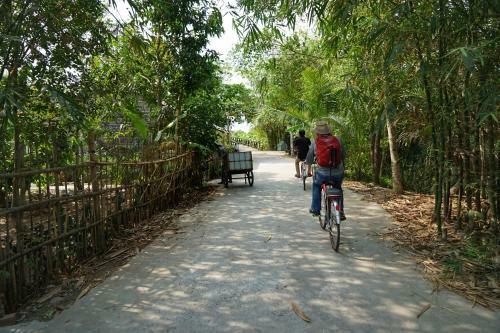 This is a homestay in the rural country of the river with fresh vietnamese cuisine served for lunch and dinner. The chef is doing a great job and so is the whole staff with management of Jack, the host is somewhere else, they are so friendly and helpfull. It is nice to eat together with the other guests at the big table in the kitchen especially for me travelling on my own. The house is nice decorated, clean with a lot of space in all rooms. Schould be great with a fan and AC in common areas and even a working jacuzzi. RIEN... Sauf peut-être, ne pas être restés plus longtemps ! À essayer les yeux fermés! La disponibilité et la gentillesse du personnel, la propreté des chambres, la nourriture excellente, le cadre vraiment relaxant, les activités proposées (spécialement la visite de la ferme de cacao. À voir absolument!). Peut-être la terrasse mériterait-elle un petit coup de jeunesse! My 3 year old and I loved our experience at Villa My Long. 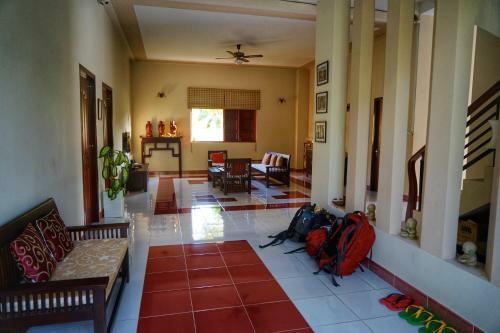 This is an authentic homestay and they cook amazing meals for their guests. 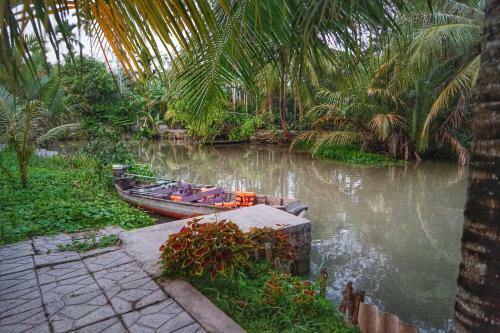 When you arrive in Can Tho they send a canoe to pick you up and take you on a magical canal journey to the homestay. We arrived in the late afternoon and it was wonderful watching all the locals on the river washing clothes and fishing. Everyone waved at us and it was so special to see how people really live down the canals outside the city. 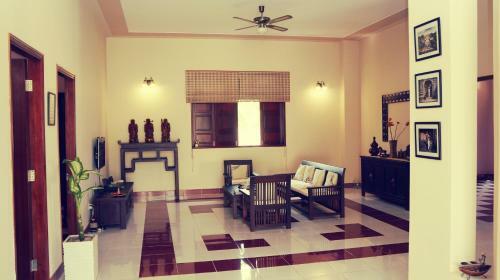 Villa My Long is so clean and comfortable we would have loved to stay longer and explore the surroundings. 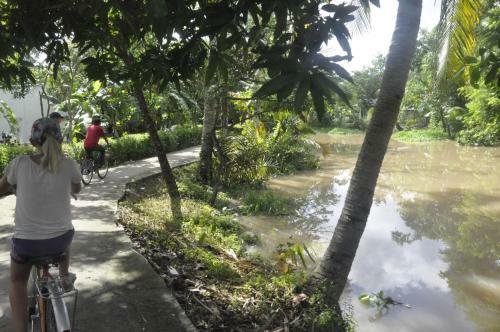 A couple there described biking around the homestay and boating to see a 300 year old tree down one of the canals, which is a tour offered by the hosts. I hope to return soon and spend more time here. My son especially loved all the pets and was so excited by 3 day old puppies. If you want to experience authentic life on the canals this is a great place to stay. We were only able to stay for one night and took the tour offered by our hosts to the floating markets which was amazing! We were on a small private boat unlike other tourists we saw and were able to pull up and buy pineapples to eat and coffee as well as interacting with the locals. The driver called us a taxi and waited with us on the banks where local children interacted with my son and my son tried out the riverside hammocks. All in all it was amazing authentic and great value for money. Highly recommended! we could have stayed longer! We had an incredible genuine Delta experience staying at Villa My Long. Exceeded our expectations. Villa My Long is a beautiful home and immaculate. My brother and I ate all of our meals there for both days and the food was healthy and delicious. The owner, Pierre, was gracious, and very helpful in planning three excursions during our stay. Prices are reasonable with excellent value. No complaints! All was perfect!